HIDDEN MATERIAL AND SECRETS REVEALED ! 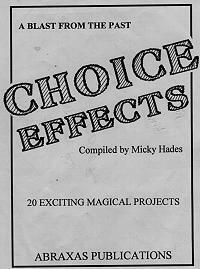 20 GREAT EFFECTS, ROUTINES AND WORKSHOP PLANS CONTRIBUTED BY ACCOMPLISHED MAGICIANS. Postage varies with destination. We will advise you of the postage cost to your address. Payment may be made by B ank Check, Travelers Check, International Money Order or PayPal. For information just open www.paypal.com on the Internet, and get the details that you need. My registration number with PayPal is my email address which is mickyhades@shaw.ca If you pay by Western Union or send your payment by mail, send it to Micky Hades, 205 - 28 Ave N.E., Calgary AB T2E 2B2, Canada.